Discover the birthplace of American democracy selecting on this guided, 90-minute walking tour around Philadelphia, the 'City of Brotherly Love.' Learn interesting facts about the history of Philadelphia and America while visiting historic landmarks like Independence Hall, the Liberty Bell, and the Betsy Ross House, to name a few. You may choose to add on a 90 minute city tour. This option uses public transit or your vehicle. This historical tour begins with a Center City hotel pickup, or meet at the Independence Visitor Center. During this 90-minute walking tour, learn about the history of the United States, the city of Philadelphia, and the colony of Pennsylvania. Discover interesting facts about the history and origin of the Liberty Bell and Independence Hall. Learn about the history of German immigrants in Philadelphia and Pennsylvania, as well as the founding of the United States of America and the importance of the Declaration of Independence. Admire the testimonies of American history in one of the most historic places in the United States. See the famous Liberty Bell and learn about its role in the various liberation movements, such as the anti-slavery movement, women’s suffrage, and the civil rights movement. Also, discover Independence Hall, the birthplace of the nation. This is where the Declaration of Independence was adopted and the Constitution was written. Admire the impressive original document in the West Wing. 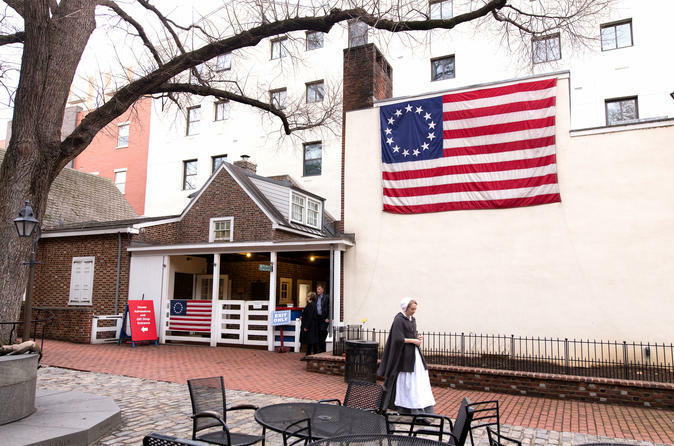 Then, stroll through the garden of the Betsy Ross House, which was built in 1740 and named after the woman who is said to have sewn the first American flag. Finally, visit the New Hall Military Museum, the Merchants' Exchange Building, Franklin Court, and Christ Church. You may choose to add on a 90-minute driving tour and visit additional sights including the Rocky Statue. The tour ends back at the Independence Visitor Center or with a Center City hotel drop-off.